DETROIT—The Community Foundation for Southeast Michigan announced it is awarding grants totaling $75,000 from The HOPE Fund to support the work of the LGBT Older Adult Coalition and the American Civil Liberties Union Fund of Michigan. A grant of $50,000 will support the Older Adult Coalition to establish a lesbian, gay, bisexual and transgender culturally competent referral network for aging services. An additional grant of $25,000 was awarded to the ACLU Fund of Michigan to support the expanded work of the LGBT Project, an education initiative aimed at informing public opinion and policymakers about LGBT issues and to assist clients who have experienced discrimination or violations of their constitutional rights. The ACLU is the United State’s guardian of liberty, working daily in courts, legislatures and communities to defend and preserve the individual rights and liberties that the Constitution and laws of the United States guarantee everyone in this country. The ACLU also works to extend rights to segments of our population that have traditionally been denied their rights, including people of color; women; lesbians, gay men, bisexuals and transgender people; prisoners; and people with disabilities. The HOPE Fund of the Community Foundation for Southeast Michigan exists to strengthen and empower organizations that serve the lesbian, gay, bisexual and transgender communities, by supporting important charitable activities in southeast Michigan and by encouraging individuals to consider what they can do with their personal philanthropy. The Fund works to increase 1) the capacity and strength of nonprofit organizations serving the lesbian and gay community; 2) awareness of and positive responses to their needs; and 3) available services. Since its inception in 1994, more than $1.8 million in grants have been made through the Foundation’s HOPE Fund. The HOPE Fund also helps people carry out their charitable wishes to benefit the lesbian, gay, bisexual and transgender communities. 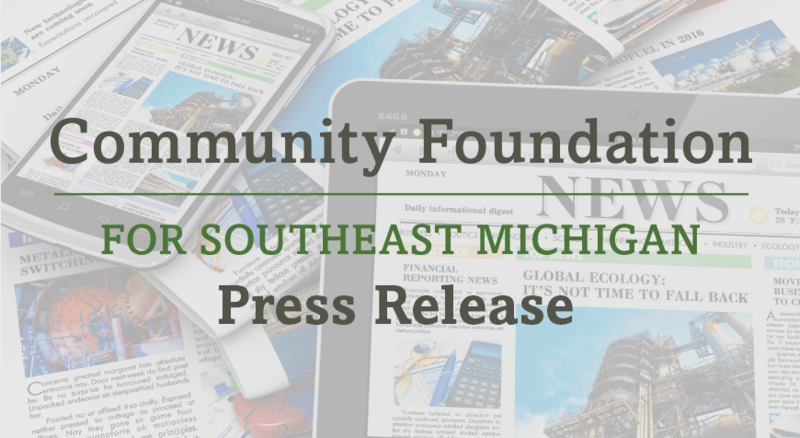 The Community Foundation for Southeast Michigan is a full-service philanthropic organization leading the way to positive change in our region. As a permanent community endowment built by gifts from thousands of individuals and organizations committed to the future of southeast Michigan, the Foundation supports a wide variety of activities benefiting education, arts and culture, health, human services, community development and civic affairs. Since its inception, the Foundation has distributed more than $598 million through more than 47,000 grants to nonprofit organizations throughout Wayne, Oakland, Macomb, Monroe, Washtenaw, St. Clair and Livingston counties.